1) Cost per second at Level Perk – the cost in Magicka per second of casting this spell once the required Perk Level (e.g. Master) is attained. 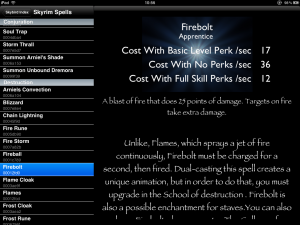 2) Cost per second with no perks – the base cost in Magicka per second of casting the spell with no perks of any kind. 3) Cost with full perks – the cost in Magicka per second of casting the spell if you have reached Perk Level 100 in the Skill Branch. Using these measures, you can easily see the advantages of levelling for a particular spell, allowing you to strategically plan your upgrades. The analyser also includes a detailed and accurate report on the spell effects, and additional notes which offer advice on the benefits or negatives of choosing this spell. 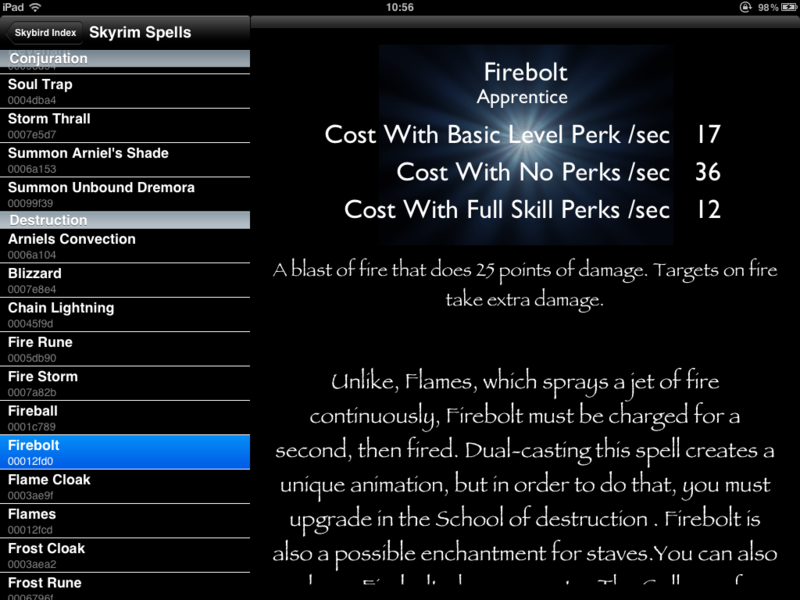 The table also includes unique item codes for every spell – you can use the in-game console to create these spells and add them instantly to your character’s known Spells. Using the Spell Analyser, you can tailor your approach to suit the enemy or situation.